The son of a brilliant but combative Hall of Fame baseball executive, Lee MacPhail inherited his father’s intelligence and a love of baseball, but a wholly different personality. While Larry had a short and somewhat mercurial baseball career colored by both triumph and controversy, his son Lee spent four decades in baseball and earned the respect and admiration of nearly everyone he met. Despite their vastly different styles, in 1998 Lee became the only son of a Hall of Famer to earn that honor himself, having surpassed his father’s accomplishments in the game. Leland Stanford MacPhail Jr. was born October 25, 1917, in Nashville, Tennessee. His mother, the former Inez Frances Thompson, had three children and tended to the home. Lee was the second child, following sister Marian and preceding brother Bill. Lee’s father, also Leland Stanford but known as Larry, was a young Chicago lawyer sent to Nashville to help a struggling department store. When the U.S. entered the Great War, Larry enlisted and went to France, while Inez took the two children to Florida to live with relatives. When Larry returned home after the war, he opened a law practice in Columbus, Ohio. Lee had a rather idyllic childhood—his family owned a cottage on Lake Michigan where Inez and the children spent every summer. His father had his law practice, owned a succession of businesses, and worked as a Big Ten football referee. In the winter of 1930-31, Larry put together a group to purchase the local Columbus Senators, a club in the American Association, and became the team’s president. “Until that time,” remembered Lee, “I thought that the biggest sporting event in the world was the Ohio State-Michigan football game. Baseball had hardly existed for me. But from that moment until this , it has been a central and very important part of my life.”1 Lee was 13. His father ran the Senators for three years, and then the National League’s Cincinnati Reds for three. In the fall of 1936, as his father was resigning from the Reds, Lee MacPhail went off to Swarthmore, a small liberal arts college near Philadelphia. He lettered in both football and baseball, earned good grades, and was president of his Delta Upsilon fraternity his senior year. More importantly, he met and fell in love with Jane Hamilton, and the two became engaged. After his 1939 graduation he intended to get a job in baseball. But his father, now running the Brooklyn Dodgers, insisted that he spend a year in an unrelated business, hoping his son would change his mind about baseball. Larry got him a job in South Carolina with Kennett-Murray, a company that bought livestock from local farmers and sold it to packing companies. Lee’s work was mainly physical labor. In late 1940, Larry offered him a job as business manager of the Dodgers’ club in Reading, Pennsylvania, launching Lee’s baseball career. Larry and Inez had a rocky marriage, and they finally separated the summer after Lee graduated from college. Larry had begun a relationship with his secretary. A distraught Inez left home, taking residence with Jane Hamilton, Lee’s fiancé, who was living in Brooklyn. When Larry learned where his wife had holed up, he told Jane he never wanted to see her again. That fall, while Lee was working in South Carolina, he and Jane married in Rhode Island. Larry was not invited, but showed up anyway, “exuding charm as he could do when he wished,” recalled Lee2. He worked for his father on a couple of occasions, but it was not always easy. In his memoirs, Lee spoke much more affectionately about his mother. MacPhail spent 1941 in Reading. As business manager, he worked on the schedule, made the hotel and bus arrangements, supervised a staff (groundskeeper, clubhouse man, public address announcer), paid the bills, worked with the press, did public speaking, and wrote a monthly newsletter. This was life in the minor leagues at the time, and it gave him a good understanding of how the baseball business worked. The next year he left the Dodgers to take a job as general manager of the Toronto Maple Leafs, an unaffiliated team in the International League. In this role he had to find players (via trading or signing) and work with the manager, Burleigh Grimes. But working for his father proved difficult again. When manager Billy Meyer had to leave the club in 1946 for health reasons, Lee appointed a coach to take over. When Larry found out, he called his son and told him, “If he’s still managing on Friday, you’re fired.”3 Lee quickly hired Grimes to finish the season. Late in the 1947 season, Larry told Lee he wanted him to return to New York after the season to assume a new job in the front office. As it happened, the Yankees won the World Series that October, and Larry had a public meltdown during the celebratory party at New York’s Biltmore Hotel. During this bizarre episode, MacPhail managed to insult numerous people, and physically assault both George Weiss, his farm director, and Dan Topping, one of his fellow owners. In the aftermath, Topping and Del Webb bought Larry’s interest in the club, and the elder MacPhail’s baseball career was over. The younger MacPhail faced an uncertain future as well, as Weiss, the new general manager, and Topping, the new president, had to decide what to do with the son of the guy they had just fired. Weiss decided Lee could stay, but he had to go back to Kansas City. After a final year there, Weiss brought him to New York in 1949 as one of the club’s regional farm directors. MacPhail worked for Weiss for a decade, becoming sole farm director in 1955 and director of player personnel in 1957. The Yankees developed a lot of talent in this period, and MacPhail was responsible for working with all of the minor league clubs and the scouts. The Yankees won nine pennants and seven World Series during MacPhail’s ten years working for Weiss in New York. During these years Lee and Jane lived in Westchester with their four boys, Leland III (born 1942), Allen (1945), Bruce (1951) and Andy (1953). The hiring of MacPhail lessened the bonuses and led to a general calming of the organization. “Bringing in MacPhail was the best decision the owners ever had,” recalled Bob Brown, a longtime Oriole front office man. “Lee built morale.”5 After another sixth-place finish in 1959, the club broke through with an 89-65 record and a second place finish in 1960. A solid group of players from their system – Robinson, Ron Hansen, Jerry Adair, Milt Pappas, Steve Barber, Chuck Estrada and others – made up a youthful core. After the 1960 season, MacPhail fired McLaughlin. “It got to the point,” MacPhail recalled, “where you were either a ‘McLaughlin player’ or a ‘Richards player’ in the organization, and there were decisions made on that basis. Paul and Jim just never could get along. I finally told Jim we were going to have to do something. I hated to do it.”6 Harry Dalton, a 32-year-old assistant, took over the farm system. Less than a year later, Richards resigned to take over the new Houston Colt .45s. With the drama gone, MacPhail gave Dalton the freedom to run the farm system and the scouting staff. With the great staff of minor league managers that McLaughlin had assembled (including Earl Weaver and many other future major league managers and coaches), an instructional philosophy in place, and his own organizational skills, Dalton created “The Oriole Way,” and Baltimore was soon the model organization in baseball. In a five-year period beginning in 1959, the Orioles signed Boog Powell, Dave McNally, Jim Palmer, Mark Belanger, Dave Johnson, Dean Chance, Tom Phoebus, and Andy Etchebarren, along with several other future major leaguers. To supplement the youngsters, MacPhail proved adept at finding useful players from other organizations. He acquired Jim Gentile from the Dodgers in 1959, and the first baseman provided some good power for a few years (especially in 1961, when he hit 46 home runs). He picked up center fielder Jackie Brandt from the Giants in 1959, relief pitcher Stu Miller from the Giants in 1962, and pitcher Robin Roberts (who had been released by the Yankees) also in 1962. In early 1963 he acquired veteran shortstop Luis Aparicio from the White Sox for four good players: infielders Ron Hansen and Pete Ward, outfielder Dave Nicholson, and veteran relief ace Hoyt Wilhelm. The cost proved to be steep, but Aparicio provided outstanding defense and base running for several years in Baltimore. The 1964 club, with Powell, Aparicio, and Robinson (league MVP) having big years and Steve Barber, Milt Pappas and Wally Bunker anchoring a fine pitching staff, won 97 games, finishing just two games back of the Yankees for the AL pennant. They won 94 more in 1965. After the 1965 season baseball hired a new commissioner, retired Air Force General William Eckert, a man who knew little about how the baseball business worked. To help ease his transition, the owners enticed MacPhail to accept a new job as Eckert’s assistant. A change in Oriole ownership created just enough uncertainty to push MacPhail to make the move. Jerry Hoffberger, the president of the National Brewing Company, had been a silent partner in the club since 1953. But he gradually accumulated enough stock to gain control. Hoffberger and new team president Frank Cashen urged MacPhail to stay. “I appreciated their words,” MacPhail recalled, “but somehow I felt it was time to move on.”7 As his final act as the Orioles GM, MacPhail attended the 1965 winter meetings and held talks with Cincinnati on a deal to bring star outfielder Frank Robinson to Baltimore. “I told [Reds GM Bill] Dewitt that I was leaving and would have to clear it with Harry Dalton, the general manager-to-be.”8 Dalton, in his first act as GM, approved the deal. The Orioles went on to win the 1966 World Series and become the winningest team in baseball over the next two decades. Jane and Lee returned to the New York area, finding a house in Hartsdale, not far from where they had lived for a decade during his Yankee years. MacPhail liked Eckert personally, and believed that he could have worked into the role if given a longer chance. As it was, the press was critical of his lack of knowledge about the game, and the owners seemed to rely on him less and less. “I was always with him and was generally described as the man who was there to show him where second base was,” he recalled9. MacPhail spent much of his day in Eckert’s office listening in on phone calls and coaching his boss on what to say. In the end, MacPhail kept the job for one year, satisfying the agreement he had made. Late in the summer he had the opportunity to get back to running a team, and he took it. At the end of the 1966 season, he was named The Sporting News Executive of the Year, both for his efforts in building the champion Orioles and for his work with Eckert. MacPhail’s next job was back with the Yankees, who named him their general manager in October 1966. The club had been purchased by CBS in 1964, and fell to sixth place and tenth (last) place the next two years. In response, CBS named Mike Burke club president, and Burke talked MacPhail into running the baseball part of the organization. Burke focused on promoting the team (which had become very unpopular), selling tickets, and Yankee Stadium itself. For the most part, Burke left MacPhail alone to run baseball operations, and the latter got to work. In an interview soon after taking over, MacPhail said he wanted to rebuild from the bottom. “There have been problems in the organization, like George Weiss leaving and a general turnover at the top . . . and frankly, I think their scouting staff got a little old,” he said. “The farm system stopped producing the kind of players they needed to stay on top and down they went.”10 Within a few months he traded Roger Maris, Clete Boyer, and Pedro Ramos; within a few years nearly all of the 1964 champions were gone. Whitey Ford and Mickey Mantle were allowed to retire as Yankees, but the rest were sent packing in favor of younger players. With Lyle and Nettles added to Stottlemyre, Peterson, White, Munson, Murcer and other developed players, many observers considered the Yankees one of baseball’s best teams heading into 1973. Before the season started, CBS sold the club in January to a group led by Cleveland shipbuilder George Steinbrenner, who was destined to be the dominant force in the front office for the next 35 years. Burke resigned a few months later, and MacPhail and Houk followed at the end of the season. “As the season approached an end,” he recalled, “it became very apparent that working for the Yankees would be quite different from what Ralph and I had been used to.”13 The Yankees were in first place much of the summer, but a brutal August left them far behind the Orioles. Later, MacPhail looked back on his Yankee GM years with pride. “The general impression of people today,” wrote MacPhail years later, “is that CBS did not provide good ownership – that it would not spend money to improve the team. Actually CBS did everything in its power—under the baseball rules in force at the time—to improve the club. Scouting and player development budgets were increased and it gladly would have purchased players had there been good players available for purchase. And actually, the team did improve.”14 During the years between the start of the amateur draft (1965) and the advent of free agency (1976) the Yankees could not rely on money or prestige to build their team. It took patience, and the Yankees were vastly improved from the 10th place club MacPhail and Burke inherited. Off the field, MacPhail experienced heartbreak in these years. In February 1969, his son Lee MacPhail III, working as the general manager of the Reading Phillies, died in an automobile accident returning home from a baseball banquet. On January 2, 1972, Jane MacPhail died of a heart attack at age 55. Lee and Jane had been married for 31 years. In late 1974, Lee married Gwen Brandt, who had grown up in Columbus and later became friends with both Lee and Jane. Lee’s second marriage was also a good one, lasting 28 happy years until Gwen’s death in 2002. Just as MacPhail was getting ready to leave the Yankees in 1973, he was approached about taking over as AL president to succeed the retiring Joe Cronin. MacPhail was hired quickly, and held the post for the next ten years. By the 1970s, league presidents had little tangible power other than their ability to build consensus. The league office was in charge of overseeing any franchise sales, the umpiring staff, disciplining club employees if necessary, and making the league schedule. As an experienced, well-respected executive, MacPhail served on numerous high-level committees, taking part in all of the momentous changes and events baseball went through in this period. These included the battles with the players that led to the end of the reserve clause, the AL expansion to Seattle and Toronto, and the 1981 player’s strike. MacPhail was a loyal supporter of commissioner Bowie Kuhn. He worked successfully to get Kuhn’s contract renewed in 1976, and again — but unsuccessfully — in 1983. For entertainment, Lee and Gwen MacPhail went to a lot of baseball games, and Lee made a point of getting to each AL city at least once every year. The most famous ruling of MacPhail’s presidential tenure rose out of events that took place on July 24, 1983, at Yankee Stadium. Trailing 4-3 with two outs in the top of the ninth, Kansas City’s George Brett hit a two-run home run off Goose Gossage, seemingly giving the Royals a 5-4 lead. New York manager Billy Martin came out and argued that Brett had too much pine tar on his bat, and home plate umpire Tim McClelland examined the bat and agreed. Brett’s home run was nullified and instead he was ruled out, ending the game. Brett and the Royals went crazy, and the Royals ultimately lodged an official protest, throwing the decision in the lap of MacPhail. The game was concluded on August 18 (an off day for both clubs) with four quick outs. On December 31, MacPhail’s last official day as league president, Steinbrenner called MacPhail and asked him never to return to Yankee Stadium except on business. Before the 66-year-old MacPhail left the presidency, he was asked to take a new job, that of head of the Player Relations Committee. This was the group that represented ownership in their negotiations with the players. Ray Grebey, who had led the negotiations throughout the bitter 1981 strike, was fired in 1983. Grebey was a scapegoat who paid with his job for a divided ownership. MacPhail, a respected friend of most of the owners, was asked to take over. He agreed to do so through the next bargaining round. He actually held both jobs for several months before his replacement as AL president, Bobby Brown, was available to take over. After nearly two years of talks, MacPhail and Donald Fehr, acting head of the players’ association, came to an agreement on August 7, 1985, after a two-day strike. (All games were made up later in the season.) Although MacPhail could not get the payroll restrictions the owners wanted, he did manage to extract a couple of major concessions from the players: the service time requirement to become eligible for salary arbitration was increased from two years to three years; and the players finally dropped their demand that one-third of national television revenue be set aside for their pension fund. The latter had long been the standard, but the explosion in the size of the TV deals had made the owners dig in on this issue. In the end, the pension contribution more than doubled to $32.7 million per year, though it was now “only” 18 percent of TV revenues. 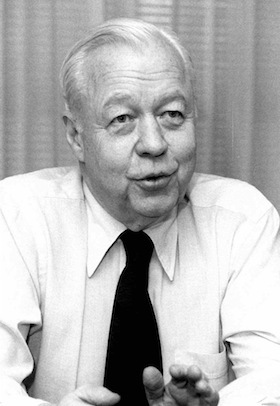 With the strike settled, MacPhail tendered his resignation, effective at the end of 1985. Upon his retirement from the game, he was feted with several dinners over the off-season. The commissioner (now Peter Ueberroth) established a $100,000 scholarship at Swarthmore in MacPhail’s name. The MVP award of the American League Championship Series was renamed the Lee MacPhail Award. MacPhail enjoyed a long and healthy retirement, and he and Gwen travelled and enjoyed life in New York. MacPhail remained involved in baseball, and his counsel was sought often by the game’s leaders. He joined the Hall of Fame’s board of directors in 1974 and he and his brother Bill were on hand to accept their father’s posthumous induction in 1978. Lee MacPhail maintained his health well into his 90s, still showing up at baseball functions on occasion. He died at age 95 on November 8, 2012, in Delray Beach, Florida, where he had relocated late in life. Three sons (Bruce, Allen and Andy) and many grandchildren and great-grandchildren survived him. Andy won two World Series as general manager of the Twins, and later held executive roles with the Chicago Cubs and Baltimore Orioles. Lee’s grandson Lee IV was a longtime scout, and worked for the Seattle Mariners as of 2014. 1 Lee MacPhail, My Nine Innings: An Autobiography of 50 Years in Baseball (Westport, CT: Meckler Books, 1989), 5. 2 MacPhail, My Nine Innings, 14. 3 MacPhail, My Nine Innings, 40. 4 MacPhail, My Nine Innings, 60. 5 Eisenberg, From 33rd Street to Camden Yards (Chicago: Contemporary Books, 2001), 67. 6 Eisenberg, From 33rd Street to Camden Yards, 70. 7 MacPhail, My Nine Innings, 79. 8 MacPhail, My Nine Innings, 80. 9 Richard Goldstein, “Lee MacPhail, Executive Who Led American League, Dies at 95,” New York Times, November 9, 2012. 10 Joe Falls, “What’s Ahead For the Yankees,” Baseball Digest, January 1967, 47. 11 Jim Ogle, “Yanks’ MacPhail Lashes at Baying Wolves,” The Sporting News, June 17, 1972. 12 Jim Ogle, “Yanks Terrific, Soul-Searching Reveals,” The Sporting News, August 19, 1972. 13 MacPhail, My 9 Innings, 126. 14 MacPhail, My 9 Innings, 124. 15 MacPhail, My 9 Innings, 155. 16 Bill Madden, “Lee MacPhail, the thorn in George Steinbrenner’s side for years and oldest living Baseball Hall of Famer, dead at 95,” Daily News, November 9, 2012. 17 G. Richard McKelvey, The MacPhails (Jefferson, NC: McFarland, 2000), 240. 18 McKelvey, The MacPhails, 311-313.